Cobourg, Ontario has a display of love locks not far from its waterfront, including the one above. 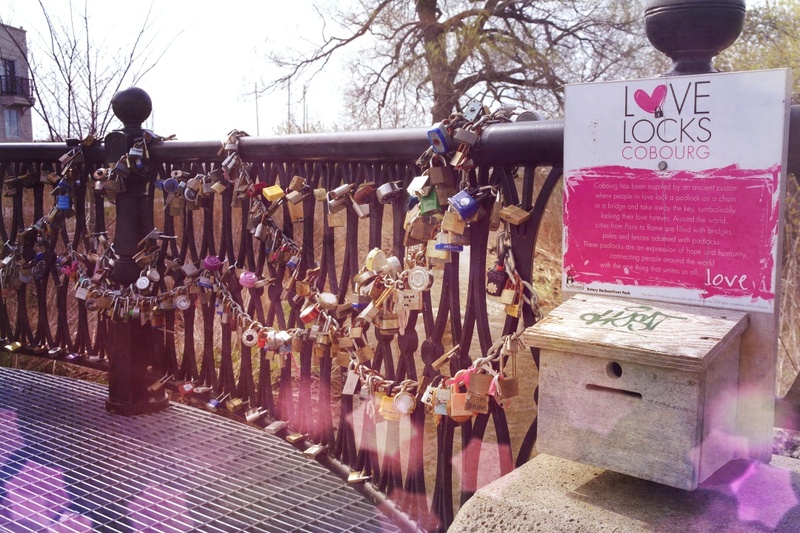 Cobourg has been inspired by an ancient custom where people in love lock a padlock on a chain or a bridge and take away the key, symbolically locking their love forever. Around the world, cities from Paris to Rome are filled with bridges, poles and fences adorned with padlocks. These padlocks are an expression of hope and humanity, connecting people around the world with the one thing that unites us all... LOVE. Ironically, in Paris, love locks have proven to be a nuisance. There were so many locks weighing down fences along the river several years ago that they were posing a safety hazard. Authorities had to cut them down and remove them.